There’s nothing else quite like a dance costume—it carries the excitement of performances yet to come, and of course, there are all those sparkles! For many children, wearing a costume brings out the confidence and poise they’ve been working so hard on in class, and it is one of their most favorite parts about dancing on stage. Do encourage your dancer to find a safe place at home to keep their costume. You’ll have their “buy-in” for keeping it in tip-top shape! Don’t allow playtime in the costume. If something bad happens, it is too late to order a new costume and receive it on time, so save the dress-up time for after the recital. Do keep tutus upside down on the hanger, unless otherwise specified by your child’s teacher. This helps keep the tutu fluffy! 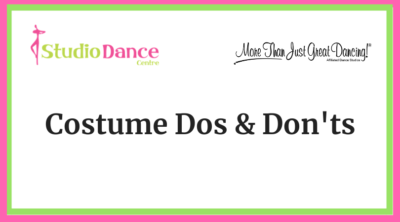 If the costume is wrinkled, Do allow it to “rest” outside of the garment bag. Using a steamer is OK too if you are experienced with one. Do write your child’s name or initials on the label of their costume, tights, and shoes. This is a tremendous help if anything is lost or left behind. Don’t forget that costumes are not custom-made, so small alterations (such as tacking straps or hemming pants) may be needed. We include alterations in your Performance Package, so you can bring your child to meet with our seamstress on February 23rd and March 2nd. Do make sure the costume is ready to go for Photo Week, which is April 1st-6th. Make sure it is not crumpled or missing anything, and bring it with you in its garment bag. If you ever have a question about the best way to store or care for a specific dance costume, please ask! We’re happy to help! « What is the Spring Concert?